Who Are The Young Heroes of History? 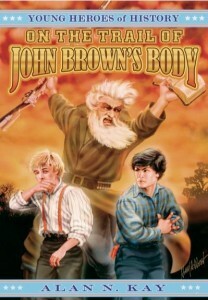 “The second in Alan N. Kay’s Young Heroes of History series, On the Trail of John Brown’s Body, is every bit as good as the first. Whereas that book juxtaposed the plight of a slave family and a northern family filled with abolitionists and sympathetics, this book follows the adventures of two boys and their fathers as they journey to the Kansas Territory in the days when John Brown cast the longest shadow in the land. David and George, two of the young heroes from the first book, are the main characters here as well, along with their fathers. They have typical frontier adventures, but always in the background (and often in the foreground) is the specter of war, brought on by the increasingly violent actions of abolitionists like David’s father. The arrival of the boys in “Bleeding Kansas” brings that state’s bloody conflict into sharp focus. And by having David’s father, John, be a part of John Brown’s brigade, the author gives us an up-close glimpse of the passion (and, some will say, madness) of Brown himself. This book succeeds the most by having the reader follow the typical adventures of young boys (playing baseball, getting into fights, doing odd jobs for spending money) while at the same reminding that reader that the setting for these typical adventures is Civil War-era America. To his credit, Alan Kay succeeds at both. ” Here’s the second book in a planned series of ten adventurous historical fiction titles from social studies teacher Alan Kay. Cousins David and George Adams find themselves “caught between two worlds,” and the only way of escape is to find David’s father, John, who lives in a wild territory known as “Bleeding Kansas. Kay treats readers to a rich description of the countryside during the boys’ journey. They experience the “sweet, refreshing scent” of a wide, wildflower-strewn prairie, where “green grasses waved in the wind like waves approaching a shore.” The boys meet animals unheard of back in Boston, and insects like fireflies, which George compares to “millions of tiny lanterns. “I thoroughly enjoyed this second chapter in the Young Heroes of History Series. Again in this story, readers are thrown into the times of violent struggles and crisis. When the boys learn the truth of John Brown’s raid at Harpers Ferry the family is divided in the heated slavery debate.